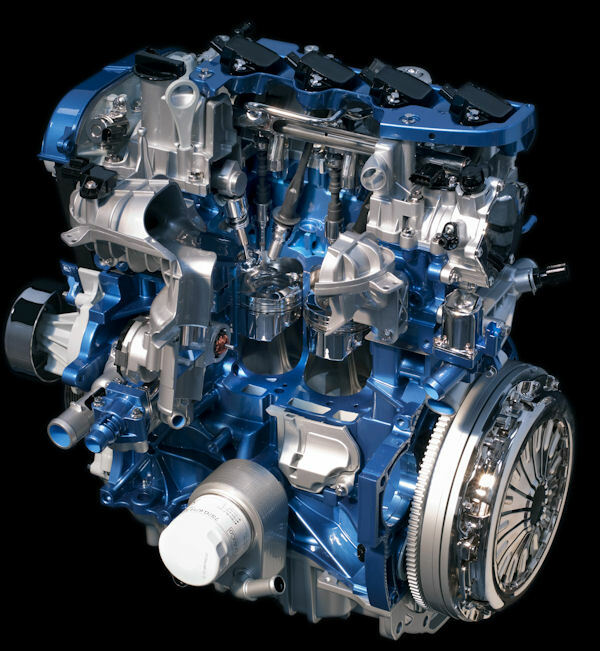 Ford’s new EcoBoost 1.6 liter DOHC inline 4 is about to make it’s first appearance in North America. It will be interesting to see the horsepower rating, since there are at least two versions of this engine in the current and near term, including one thought to be at least 180 HP for the upcoming Fiesta ST. And then there is the 2 liter EcoBoost: there are 200, 240, and 250 HP versions. As we reported two years ago when the 1.6 EcoBoost was first shown in public in concept form, the engine features Central Direct Injection, where the injector is located in the top of the combustion chamber, pointing down – rather than to the side as in conventional Direct Injection. The 1.6 liter EcoBoost was announced today at the Frankfurt show, but this detail was not. It is shown clearly in the Ford Press-supplied image below, to the left of the spark plug. Note the corresponding depression in the piston directly below. The concept engine makes 180 HP. 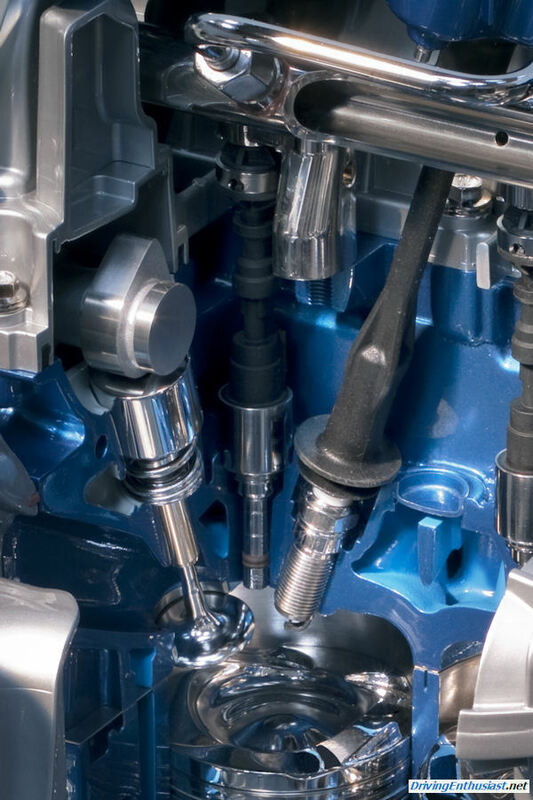 Central Direct Injection, the next step in the evolution of Direct Injection for petrol engines, is also used in the new Jaguar 5 liter DOHC V-8 engine. It’s benefits include even more precise fuel metering and burn, yielding better emissions, economy, and performance. DEARBORN, Mich., Oct. 4, 2011 – Ford continues to deliver more choices for customers craving top fuel economy, offering its largest-ever EcoBoost® engine lineup in the all-new Ford Escape debuting next month and an all-new C-MAX Hybrid that’s 25 percent more fuel efficient than even today’s Escape Hybrid. The all-new Ford Escape, slated for reveal next month at the Los Angeles Auto Show, features a powertrain lineup with three fuel-efficient four-cylinder options, including the new 1.6- and 2.0-liter EcoBoost engines and a 2.5-liter Ti-VCT four-cylinder. The Escape will be Ford’s first SUV to be available with two fuel-efficient EcoBoost engines, delivering class-leading fuel economy and performance. 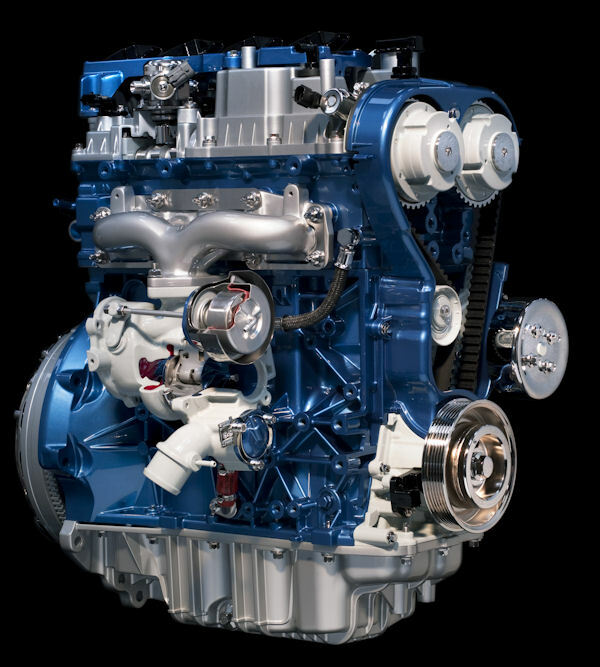 Ford’s 1.6-liter EcoBoost engine, which uses turbocharging, twin independent variable camshaft timing (Ti-VCT) and direct injection to deliver the performance feel of a larger engine, makes its North American debut in the new Escape. It is expected to deliver even higher highway fuel economy than the current Escape Hybrid, which is EPA-rated at 31 mpg. The new 1.6-liter engine also is expected to deliver better fuel economy than competitors’ larger four-cylinder engines. Next year, Ford also will grow its electrified vehicle production capacity when it launches the C-MAX Hybrid and C-MAX Energi plug-in vehicles. Both five-passenger hybrids will provide another fuel-efficient option for customers. The next generation of the Escape Hybrid’s award-winning powertrain moves to the five-passenger C-MAX Hybrid and features the first hybrid transmission and lithium-ion battery system Ford is building in-house. a more than 25 percent improvement in fuel economy versus the outgoing Escape Hybrid while still offering hybrid customers the five-passenger capability they expect. The Ford C-MAX Energi targets more than 500 miles of driving range using the battery and engine, more than any other plug-in or extended-range vehicle. It also targets AT-PZEV status and delivers better charge-sustaining fuel economy than the Chevrolet Volt. Ford developed the new generation of hybrid electric vehicles using its extensive experience with first-generation hybrids including the Ford Escape Hybrid, the world’s first SUV hybrid. This led to offering the two C-MAX multi-activity hybrid vehicles that feature superior fuel economy on long road trips and in stop-and-go city traffic. “Using our platform approach to hybridization, developing two choices for customers in the heart of the market with the dedicated, front-wheel-drive Ford C-MAX was our strategy to extend the benefits of hybrid technology to even more customers,” Kuzak said. Ford is delivering electrified vehicles that are attainable, meeting real people’s needs in the center of the market where it counts the most. Ford launched the Transit Connect Electric small commercial van in 2010 and will launch the all-new Focus Electric later this year. In 2012, these models will be joined in North America by the new C-MAX Hybrid, a next-generation lithium-ion battery hybrid and the new C-MAX Energi plug-in hybrid. Ford has 13 vehicles with best-in-class fuel economy. In the most recent J.D. Power survey, Ford leads in fuel economy in more segments than any other major automaker, answering the demand of consumers for more fuel efficiency in their vehicles. Today, fuel economy is 2.5 times more important to American customers than environmental concerns when it comes to buying a vehicle. Ford Motor Company has four cars that achieve an EPA-rated 40 mpg or higher, including Fiesta, Focus, Fusion Hybrid and Lincoln MKZ Hybrid. Thirteen Ford vehicles achieve an EPA-rated 30 mpg or higher. Ford’s recent lineup of smaller, more fuel-efficient vehicles has gained significant market share in key regions of the country. Vehicles such as the all-new Ford Focus and Fiesta both achieve 40 mpg or higher, boasting better fuel economy than even some hybrids.